Om, Let me meditate on the Goddess of Ocimum, Oh, Goddess who is dear to Vishnu, give me higher intellect, And let Brindha illuminate my mind. During the churning of the Ocean of milk (ksheera sagara mathana), Sri Hari came up in the form of Dhanvantari carrying the kalasha of amruta. At that time some drops of Hari’s tears of joy fell into the amrutha kalasha. Tulasi was born out of those tears of joy. Having been born out of tears of joy, she herself gives joy. She has Lakshmi devi’s amsha in herself. That is the reason for the celebration of marriage of Tulasi with Shri Krishna on every Karthika shuddha dwadashi day. Hari likes her very much. 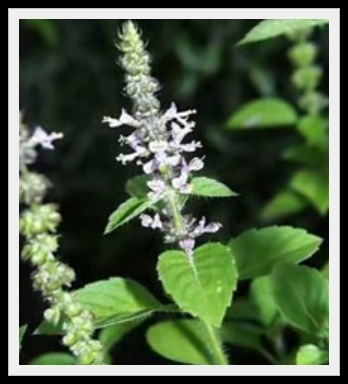 It is believed that Hari is present wherever Tulasi is present. There are two varieties of Tulasi plants viz. Sri Tulasi and Krishna Tulasi. Krishna Tulasi has blackish leaves. This is more suited for pooja in the brindavana. On the other hand Sri Tulasi which has green leaves is more suited for offering to Shri Hari.